YOU MAY BE A DIEHARD SHARPTAIL HUNTER IF . . .
You may be diehard sharptail hunter if . . .
1. 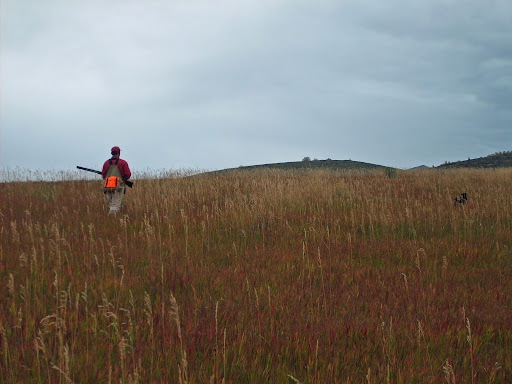 Come October, you forget about all other game birds and only desire to hike the rolling CRP fields behind hard running pointing dogs in search of the pointy-tailed grouse. Matt Lucia hikes the hills of The Royal MacNab, my favorite covert in the whole world. 2. Your old dog’s first retrieve was on a sharptail and you sincerely hope that her last one will be of this bird of her heart. Andrew Wayment and Sunny Girl pose for Sunnys first retrieve. 3. 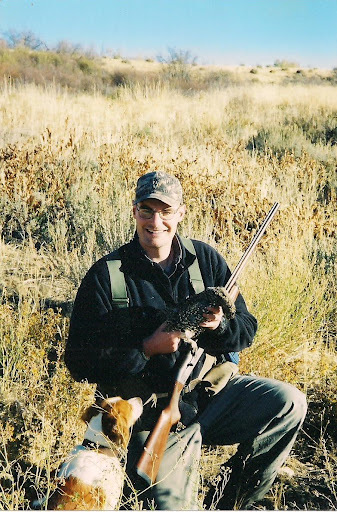 You know that Ben O. William’s book, Western Wings, is like the Bible for recognizing sharptail habitat and learning about sharptail hunting. 4. You love it when you find CRP with a little alfalfa intermixed because you know from experience that sharptails love this leafy green plant in the pea family. 5. 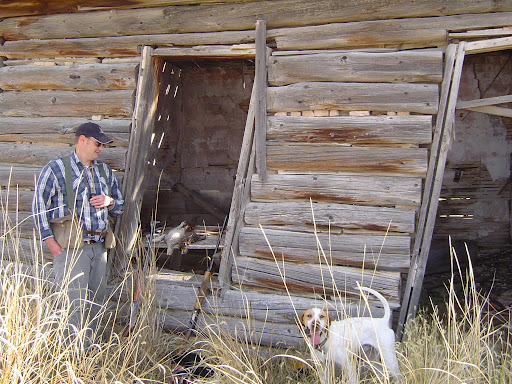 You have a rascal of a dog that usually can do no right, but somehow straightens up and hunts well whenever pursuing sharptails. Bustin’ Dusty could sure be a rascal, but for whatever reason, he really focused when it came to sharptail hunting. We had some of our best days together on these birds. 6. You realize that the very best bird to take a young child to experience the thrill of the hunt is the sharptail as the birds are plenteous and the walking is enjoyable. 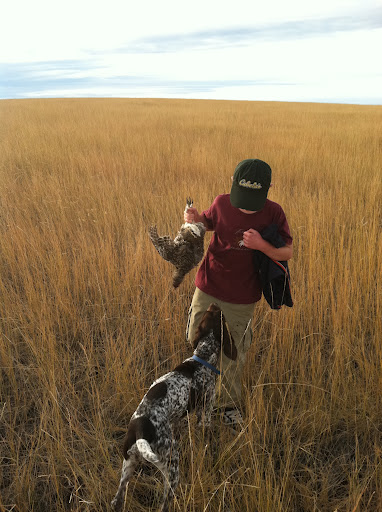 Tommy Boy and Brandy celebrate the season’s first sharptail. 7. You know that the best places to find sharptails on a windy day is on the leeward side of a big, grassy hill. 8. You can tell sharptails from other games birds when they flush because of the appearance of white spots all over their dark wings and the unmistakable call that they make when they rise, lut lut lut lut. 10. You don’t care as much for a partridge in a pear tree as you do a sharptail in a chokecherry, service berry, or elder berry tree as you know that sharptails love their wild berries. 11. You have spied one or more scout sharptail in a tree and tried to sneak up on him and his friends hoping for a point and a shot, but failed miserably. Notwithstanding, you loved every second of it. 12. You flushed numerous sharptails from open ground into thick timber and then hunted them like ruffed grouse. 13. You have secret, special sharptail coverts with names like, The Royal MacNab, Shanghai Noon, The Crescent Moon, and Switch-It-Up. 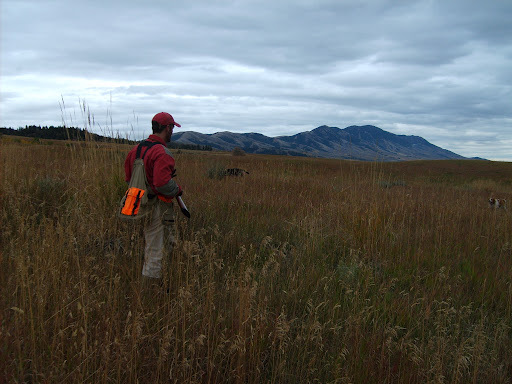 The rolling prairies with the mountains in the background are the places sharptail call home. 14. You know that as the season progresses the birds flock together in bigger coveys that are harder to approach as the birds flush wild, but you still go hunting just for a chance at a sharptail. 15. You are not a fan of the giant windmills that now dot the sharptail’s habitat because they have locked up the coverts, destroyed habitat, and impacted the birds. To you, these behemoths are like giant, white crosses on the landscape that signify great loss. 16. 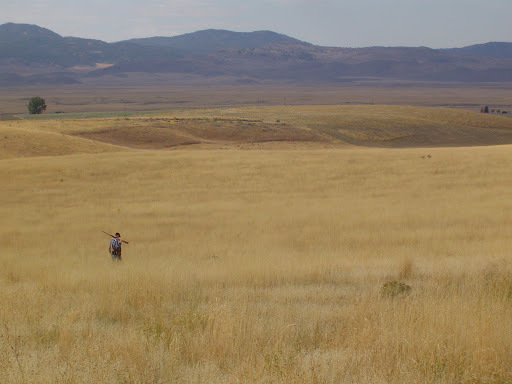 You have been in your favorite sharptail covert at first light and the sunrise over the mountains to the east was so beautiful it brought tears to your eyes. You think to yourself: This is about as close to heaven as it gets. 17. You recognize the beginning of the sharptail season is more like summer than fall, but over the next few weeks you literally witness the inevitable transition to winter. The cold wind, cloud cover, and snow flakes during the last hunt match your spirits on the last day of the hunt. 18. Although their hunting season is over, in December while hunting other birds, you have come across a sharptail’s snow den that it made to survive the blizzard the night before and you think: Man, these birds are tough! 19. 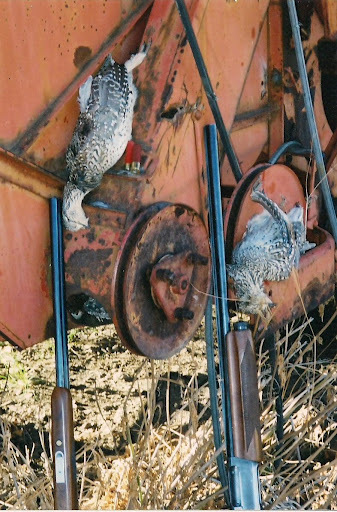 You know that most flatland pheasant hunters do not realize just how great sharptail hunting is and that is just fine with you and the birds. 20. You know that Don Thomas got it right when he called this unique game bird, Soul Chickens as they and their environs are no doubt, good for the soul. The old farm fields are gone, but the sharptail remains. Man, I love these birds! Great, thank you. I can't wait for fall! Glad you enjoyed it! I am excited for fall too, but I love summer fishing and camping too. I want to enjoy it all! Wow! Now I want to go hunting sharptail! Awesome post! Thanks Ricky! If you haven't hunted sharptail, put that on your bucket list. They are a special bird, indeed. For me, they are the essence of October in Idaho.